Flagship of the Kawasaki ATV line, the muscular Brute Force® 750 4x4i ATV received a comprehensive round of upgrades for the 2012 model year. An Electric Power Steering (EPS) system highlights the changes, but is joined by other significant new features like a more-powerful V-twin engine, new double-wishbone front suspension, six-spoke cast alloy wheels and new bodywork featuring wide-stance styling cues. Like always, dual-range four-wheel drive and a highly maneuverable chassis provide amazing traction, handling and utility. Thanks to revised tuning, a new cylinder head and increased compression ratio, the 2012 Brute Force 750 4x4i’s upgraded four-stroke fuel injected 90-degree 749cc V-twin engine offers more power than ever! Thanks to revised tuning, a new cylinder head and increased compression ratio, the 2012 Brute Force 750 4x4i’s upgraded four-stroke fuel injected 90-degree 749cc V-twin engine offers more power than ever, with enhanced low-rpm performance. The twin cylinders are fed via 36mm throttle bodies that are controlled by a 32-bit CPU. The system monitors coolant temperature, air intake temperature, air intake pressure, throttle position, vehicle speed and crankshaft angle to deliver the optimum fuel mixture. Instantaneous fuel delivery and crisp engine response help make the eight-valve engine a hit with sport riders. Despite the big power from the engine, a light feel at the throttle lever helps reduce rider fatigue. This is achieved by using a low spring rate for the throttle return springs and ball bearings in the throttle bodies. A new larger radiator is placed high in the chassis for optimum protection against mud and debris, while a new larger radiator fan and larger-diameter cooling hoses and pipes help maximize cooling performance. A self-repairing circuit breaker and dedicated fuse for the new fan also help keep things cool when the going gets tough. 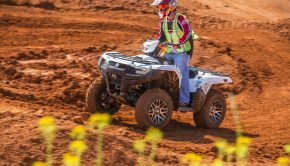 The addition of Kawasaki’s Electric Power Steering (EPS) system to the Brute Force 750 4x4i results in enhanced handling and improved ride comfort. 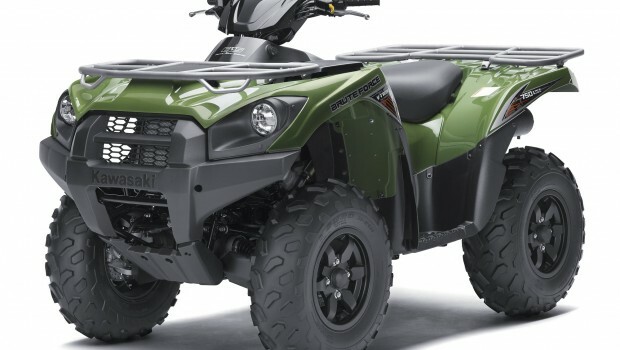 The addition of Kawasaki’s Electric Power Steering (EPS) system to the Brute Force 750 4x4i results in enhanced handling and improved ride comfort. Turning the bars causes a signal to be sent to the electronic power steering control unit, initiating power assist. The control unit monitors inputs from the vehicle speed sensor and steering shaft torque sensor to determine the amount of power assistance required from the system’s electric motor. At slow speeds or when stopped, assistance is greatest; assistance is reduced as vehicle speed increases to help ensure predictable handling. The EPS assembly enhances ride quality and control by also acting as a damping system, even when steering input is neutral, the added inertia of the electric motor acts as a stabilizer. Likewise, it significantly reduces bump steer and kickback to the handlebars caused by wheel impacts. The entire steering assembly was repositioned, so the bottom of the steering shaft no longer connects directly to the front differential. Movement of the differential due to throttle inputs in 4×4 mode no longer affect the steering assembly, this isolation provides significantly smoother handling. An upgraded fully automatic, dual-range continuously variable transmission (CVT) is mated to the powerful V-twin engine. A new high gear ratio and a thicker belt made of stronger material contributes to longer CVT belt life and reduced maintenance requirements. Revised converter weight and drive spring tuning offers improved acceleration characteristics and increased control during low-speed operation and a new layout and revised placement of the CVT air duct is more effective at helping prevent the intrusion of water and mud. Don’t need power steering? You can enjoy all of the updates to the 2012 Brute Force 750 4x4i minus power steering for $700 less at $9,299. Two- or four-wheel drive operation is selectable by simply pressing a button on the handlebar. 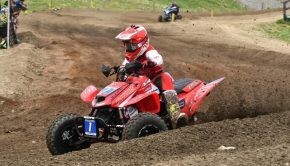 In four-wheel drive mode, the Brute Force ATV utilizes the limited-slip front differential to help maintain steering response and ease steering effort at the bars. 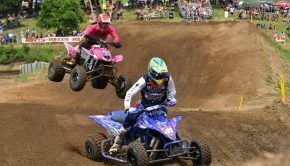 The rider can manage the amount of power to both front wheels with Kawasaki’s Variable Front Differential Control by using a small control lever on the left handlebar. 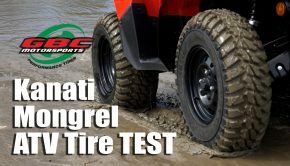 It’s a definite advantage when traversing deep mud, slippery uphill trails or large logs or rocks. The front drive shafts of the 750 4x4i feature Cardan joints. Similar to U-joints, Cardan joints help absorb torque fluctuations to the drive shaft, and the lightweight design helps to reduce vibration. The small and compact rear final gear case and sealed rear braking system are extremely rugged and efficient.